Afghans Find Happiness Despite Living In World's Third Least Happy Country : Goats and Soda Afghanistan ranks extremely low on the World Happiness Report, released for World Happiness Day on March 20. But that doesn't mean it is a place devoid of happiness. 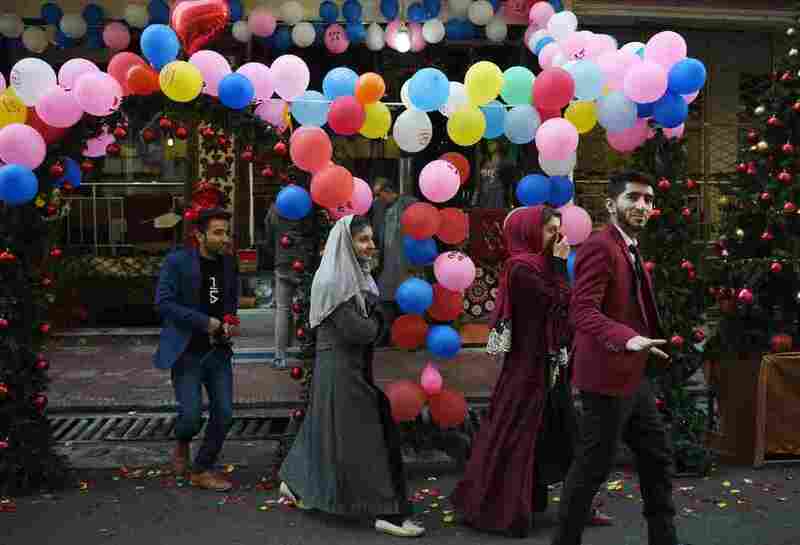 Afghan couples in Kabul out for a stroll on Valentine's Day this year. "Khosh amadee!" Omaid Sharifi, co-founder of ArtLords, an art collective, says as he invites us into his house in a manner that reflects true Afghan hospitality—with grace, a smile and open arms. The phrase is in the local language of Dari. Used to mean "welcome," it literally translates to "come with happiness" – which is a bit ironic because in the newly released World Happiness Report, Afghanistan is ranked as the third least happy country in the world. Only the Central African Republic and South Sudan are deemed unhappier. But on this particular night, it's hard to think of Afghanistan as an unhappy place. Our host welcomes us to his beautifully decorated house with its large garden. The house is older than the first wars that plagued the country 40 years ago and that often define the nature and personality of the country. Sharifi is hosting one of his famous soirees. His guests include well-known personalities like news anchors and politicians as well as social workers, corporate workers and artists, among many others. The invitees greet each other with a handshake and a kiss on the cheek as they take seats on the toushaks — Afghan cushions for floor seating — placed around the very large living room. In Afghan architecture, living rooms are specifically designed to be big enough for crowded gatherings. "In the West, people often go barhopping after a long day's or week's work to unwind, de-stress and spend quality times with friends, but in Afghanistan where we don't have too many social public spaces, we go 'house-hopping,' " says Sharifi, as he walks around the large room, socializing and attending to the needs of the constant flow of people. There's cheerful chatter and laughter – and a diverse playlist of Afghan music, Western pop and Bollywood songs. This scene is a stark contrast to the widespread image of Afghanistan as a war-torn country, often imagined in the West to be gray and dusty, a place of repression and misery. This image was further strengthened by the 2019 happiness rankings, produced by the Sustainable Development Solutions Network and based on data gathered from reports across 156 countries on how happy their citizens perceive themselves to be. While there are a variety of factors determining unhappiness, the report focused on how information technology, governance and social norms influence communities. "There has been a widespread recent upward trend in negative affect, comprising worry, sadness and anger, especially marked in Asia and Africa, and more recently elsewhere," the report notes, observing that countries with a lower happiness ranking also "suffered some combination of economic, political and social stresses." The report is what brought us to the party this past Monday night. We wanted to interview Afghans to hear their perception on their relative happiness and unhappiness. Many of the people we interviewed did not dispute that Afghanistan has its woes. "The last few years have been extremely difficult for all Afghans. We have suffered so much, and so many personal losses, it is understandable that there is a sense of frustration," admits Maryam Atahi, an Afghan social activist and communications manager at Save the Children. Atahi lost a close friend and a family member in insurgent attacks over the past year. Asked to recall her most recent unhappy memory, she choked at the thought of the loved ones she lost — and then in the same breath insists that Afghans aren't an unhappy people: "Afghans are resilient, not by choice but by need. We know how to celebrate life despite the constant violence we are subjected to if we are to remain sane and happy," she reasons before she joins in the Afghan circle dance of attan with her friends. Agreeing with her, Sharifi adds that while Afghans are exposed to a lot of negativity owing to the increasing conflict — Afghanistan had more deaths from terrorism than any other country in 2017 according to the Global Terrorism Index. "There is so much negative energy that has been building around the country in a cycle of violence that has continued for the last 40 years," he says. "Everyone is transmitting that anger and discontent — all Afghans including the children are angry." And yet he does not despair. "Afghans find spaces and opportunities to break that cycle of violence and anger," he says, explaining why he hosts social gatherings. Sharifi holds at least two such events in a week, which feature traditional music and dancing, poetry recitation, bonfires and barbecues. "Everyone is welcomed here, at any time, any day," he says. "If they need to talk, listen to music, or dance, we are always hosting." Sharifi isn't alone in keeping the Afghan culture of hospitality alive. Since Fridays are a weekly day off — the Afghan Sunday — Thursday nights in Kabul and other communities around the country are set aside for socializing. But the events are often held behind closed doors and thick walls. There is a lack of public space for celebratory gatherings – and there's also concern about the strong disapproval from the deeply conservative Afghans who disapprove of such parties because men and women fraternize. Indeed, there was a time in Afghanistan not that long ago, during the Taliban regime of the late 1990s, when music, dance and entertainment of any kind was banned. But even the fear of harsh punishment didn't stop Afghans from celebrating back then, even if it meant doing so discreetly and underground. The World Happiness Report asserts that governments and the caliber of their social services are directly responsible for a lack of happiness. 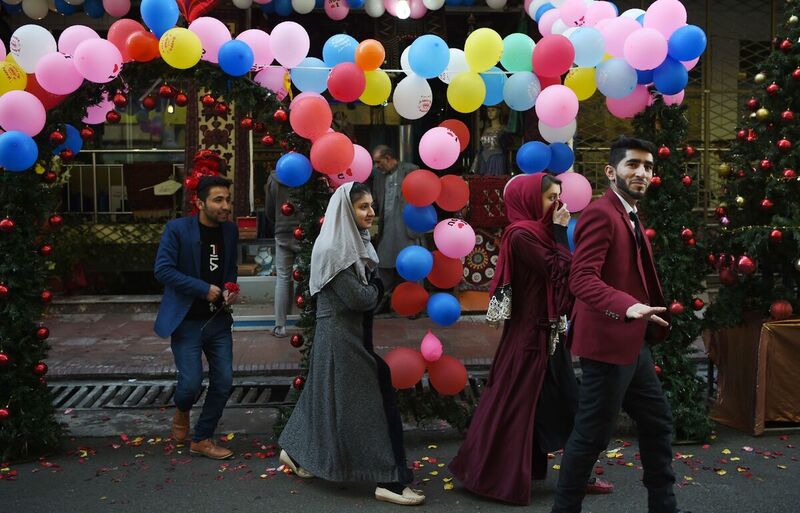 In Afghanistan, the change in the government since the fall of the Taliban regime in 2001 has had little influence on Afghanistan's relationship with happiness, at least according to the report's rankings. The Afghans we interviewed said that their government is not providing the kinds of resources that lead to happiness. But they are sympathetic to the situation of the current government with its many issues to address, like managing the ongoing conflict with the Taliban and bringing the Taliban to peace negotiations. And Afghans understand all too well that true happiness cannot be found in a fractured society. In a study on psychosocial well-being in Afghanistan currently being conducted by Martha Bragin, associate professor of social work at Hunter College, City University of New York, and Bree Akesson, associate professor of social work at Wilfrid Laurier University, spoke to 440 participants from the provinces of Kandahar, Mazar, Herat and Kabul. Bragin, an American who has worked on research and mental health projects in Afghanistan since 2002, told us that many indicators of well-being were different for men and women, but there were some commonalities. "Solh, amniyat, adalat — peace, security and justice were the most important points for both men and women to be psychologically and socially well." Bragin further observed that the Afghans she has interviewed say they seek to participate in community affairs to seek well-being. "Afghans get great satisfaction from religious and cultural participation," she says, adding that they also "no one is told how to practice his or her faith." Afghans told us that they find various paths to happiness. "Happiness is strongly linked to satisfaction and the satisfaction I derive from the work I do in Afghanistan is incomparable to anything else," says artist Kabir Mokamel. Reflecting the findings of Bragin, he emphasizes the importance of community in helping Afghans stay happy. "Being part of the community is very important to Afghans. Solitude is a foreign concept to Afghans," he says, adding that sharing emotions — joy or sorrow— helps Afghans find a sense of happiness. "Even when you take a taxi, the driver will greet you like his own family," Mokamel says. "The conversations can get very personal very quickly, and you will completely forget about your stressful day. I haven't seen such interaction anywhere else I have lived," he says. Save the Children employee Atahi agrees that recent happy memories were made in association with the community. "I was thrilled when Rashid Khan [the Afghan cricketer] played in all the big leagues around the world. I get so excited when I see my friend Farazana anchor a news segment on TV. A lot of my happiness comes from my connection to my community and my country," she explains. Mokamel also credits the unpredictability of life in Afghanistan as a reason why Afghans live to the fullest. "Surviving an attack, for instance, adds a sense of appreciation for being alive, a reason to be happy. I can't describe it, but it is a feeling that elevates me," he says. There is, to be sure, a toll taken by trauma. In their paper, Bragin and Bree note that attacks and threats to life have become all too normal: "The negative effects of the unrelenting conflict on individuals, families, communities, institutions and the culture itself continue," they write. Hadi Rasooli, a psychologist from Herat, believes that many of the mental health issues in Afghanistan are "direct or indirect effects of wars and conflicts." "Our people experience high levels of negative emotions such as worry, pain, stress and sadness, and also effects of "hidden violence" within families," he explains. He counsels patients on such issues but notes that seeking help for mental health issues carries stigma across the country. Afghans are acutely aware of this paradox of searching for happiness in times of war and conflict. "When we don't get along with each other and fight with each other, [when] we face issues like terrorism and even poverty, as a result Afghanistan becomes an unhappy place," Sangari says. Yet that does not keep people from having happy moments and memories, even in the third least happy country in the world. Mohammad Baqir Sangari is a 40-year-old Afghan taxi driver who lives in a small home with his wife and children in the west Kabul. He recalls being happiest when he lived with his extended family. "I was born in war and raised in conflict," he reflects. "But when my father was alive, we used to all live together, had fun. [Those were] some of my happiest moments."